Cant find the right backhoe tires at a price that doesn’t break the bank? Monster tires is your answer. We stock a large inventory of quality tires for Terex 760 and 760B model backhoes. We have many different treat types in stock and ready to ship anywhere in the continental us from one of our three warehouses. Burn off that old backhoe rubber and wrap some quality monster tread on your machine at the lowest price in the industry. If you are looking for new tires for your Terex Backhoe, you have come to the right place at Monster Tires! We offer a wide range of Terex Backhoe Tire Size Options, including Terex TX760 – TX860SB Backhoe Tires, Terex TLB Backhoe Tires, Terex 860 – 860SB Backhoe Tires, and Terex 760 – 760B Backhoe Tires. We offer High Quality OTR Tires for construction companies and home owners, and Heavy Equipment Tires to get your piece of equipment rolling again. Tires are the most important thing when it comes to dependability and reliability of your equipment, so don’t skimp on them. 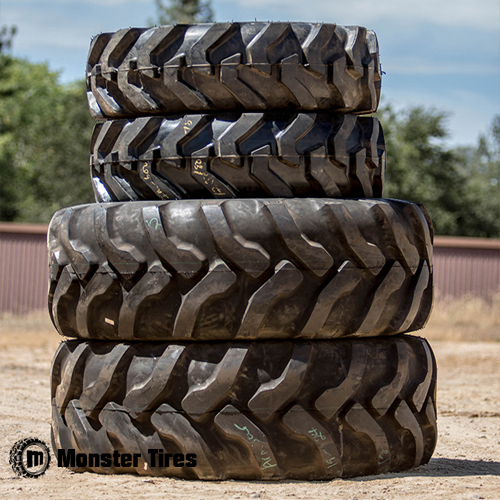 Trust Monster Tires with your Set of 4 Tires for Terex Backhoe.